Don’t be jealous, but on Sunday my sister and I are going to stuff ourselves silly on fair food at the OC Fair. Yes, I realize it’s in OC and I live in LA, but it’s actually easier for me to get to there than it is to get to the LA Fair. Gotta love LA. Anyway, this year’s theme is “Come & Get It” and that we will! 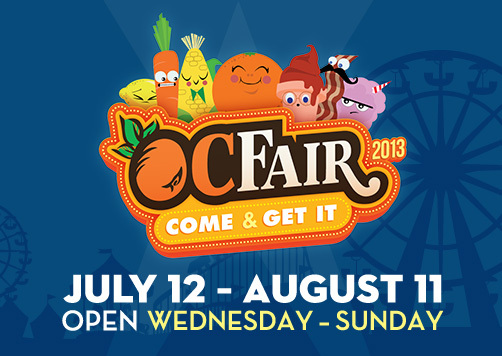 And so will you, because I am excited to be giving away two tickets for admission to the OC Fair! To enter, just fill out the Rafflecopter form below. Chicken Charlie: Krispy Kreme Sloppy Joes, Deep-Fried Bacon-Wrapped Pickles and Waffle Dogs (a hot dog wrapped inside a waffle and all on a stick). Plus, deep-fried cookie dough! Bacon A-Fair: Truffle Gouda Bacon Fries, Bacon Beer (root beer) and Cheesy Bacon Bombs. Plus, wild boar bacon on a stick will be served exclusively at the OC Fair. Biggy’s Meat Market: 17-inch The Big Rib plus the new Biggy Sausage, a 2-foot-long smoked sausage on a stick, and the Big Chic, 24 ounces of chicken breast on a stick. Ten Pound Buns: Ground bacon, whipped butter and Nutella on top of their famous sourdough “pizza” for the Bacon Nutella Bun. Pink’s Hot Dogs: The Ghiradelli hot dog is a beef dog topped with cream cheese, honey mustard, crumbled bacon and dark chocolate. More New Food: Deep-fried strawberries, a macaroni and cheese hamburger, fried bacon ice cream, deep-fried lobster, cream cheese on a stick, mango & chamoy popsicle (spicy-sweet lemon chile flavoring), heart-shaped funnel cake, Dirty BBQ Tasti Chips and more. Also, this year the OC Fair is introducing food-themed mascots including Scoop, Carl, Dip and their foodie friends all inspired by iconic Fair and farm foods such as ice cream cones, cotton candy, corn dogs, vegetables, fruit and more. Costumed characters, plushes and signage will be representing the foodie friends throughout the Fair. Every Friday from Noon-4 p.m., Fairgoers can sample the best the Fair has to offer for only $2 each sample. Fun-sized samples include funnel cake, BBQ tri-tip, lemonade, cinnamon rolls, corn dogs, tacos, gelato, cotton candy and more. The 2013 OC Fair presents two shows in The Hangar featuring charismatic celebrity chefs demonstrating their culinary prowess. Scheduled appearances include the owners and chefs of the award-winning La Casita Mexicana Restaurant Jaime Martin del Campo and Ramiro Arvizu (July 20, 4 p.m.) and award-winning chef and owner of Bottega in Napa Valley and Coqueto in San Francisco Michael Chiarello (August 1, 4 p.m.) Free with Fair admission. In addition to celebrity chefs, the 2013 OC Fair is also featuring local professional chefs from some of the county’s top local restaurants and other culinary artisans in the OC Promenade. Presentation days and times vary. On top of traditional and new Fair foods, Fairgoers can purchase gourmet fare from their favorite food trucks from inside the OC Fair gates every Thursday from Noon-10 p.m. Access is free with Fair admission and prices for food and drinks vary per truck. Watch local culinary professionals show off their chops and go head-to-head in a series of live cooking challenges set to various themes every Thursday in the OC Promenade: Meatheads (July 18), Time to Make The Donuts (July 25), Firehouse Chefs (August 1) and Vegan (August 8). Winners will receive bragging rights and an award to commemorate their culinary victory. Viewing is free with Fair admission. Most of the traditional Culinary Arts competitions have closed their registrations but the Culinary Arts department is again hosting live contests that offer late registration with the Special Culinary Contests held the last four Saturdays, including the popular OC Cupcake Classic on August 3. Registration for these contests is the Wednesday before each contest. New this year is the Salad Daze contest, which is judging for the best picnic-ready salads. For a complete list, visit ocfair.com/competitions. Chef Ray Duey is an acclaimed food sculptor who was a gold medal winner from the Food Network’s Challenge Team and will be creating works of art out of fruits and vegetables daily in the OC Promenade. Award-winning Shaile Socher creates masterful floral arrangements out of sugar and will be demonstrating her intricate and dazzling talent in the OC Promenade daily. Demonstrations are free with Fair admission. Experience being home on the range in this year-round, three-acre demonstration farm complete with crops, livestock and the Millennium Barn. Check out educational exhibits, agricultural organizations and the fruit and vegetable competitive entries. Visit ocfair.com/competitions for details on the Garden and Floral competitions offered. Disclosure: The kind folks at the OC Fair knew I couldn’t wait to taste the deep-fried cookie dough and offered me two tickets for admission and food vouchers as well as two tickets to give away. Obviously I couldn’t say no. Giveaway ends on Friday, July 19, 2013. One winner will be selected at random shortly thereafter and contacted by email. I am most excited about just attending. This will be my first year getting to attend since moving to SoCal 2 years ago. I am so excited to finally get a chance to go!!! The food, the animals, the rides, the exhibits, everything. I am from Montana, so this is bigger than even our state fair is. I’m most excited to spending time with friends as well as tasting all of the food! SO excited for the new fried foods every year! cookie dough, waffle dog, and fried strawberries! Wahoo! I’m most excited for the samples! I’m just excited to go for the whole fair experience. We go every year and I’m excited for my 2 year old to actually get to enjoy everything this year. I’m always a sucker for fried food–I want to try the deep fried cupcake and also the cookie dough. But I won’t walk away from the wine garden without at least 1 glass! I am as always most excited for all the wonderful and exciting food! Also the animals… I’m a fanatical animal lover and I love visiting with all the gorgeous creatures that I don’t get to see on a regular basis. I want to try the churro funnel cake thats supposed to taste better then the normal one. the kitchen challenge sounds super fun to watch! I love the deep fried candy bars.